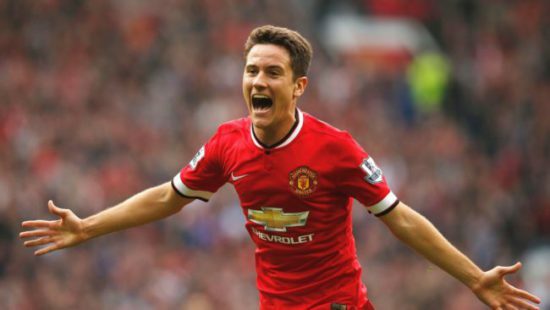 Manchester United midfielder Ander Hererra is reportedly poised to commit his future to the club on a long term after a fantastic season under Jose Mourinho last term. The Spanish international was linked with a move to Catalan giants all summer but, with no official bid tabled for him, the fan favourite is settled and happy to remain at the club for years to come. The 28-year-old was an important player for the Special one last season but has his role reduced so far this term with the arrival of Nemanja Matic from Chelsea. The Portuguese tactician has opted for a midfield pivot of Paul Pogba and Nemanja Matic this season limiting the Spaniard to just starting two of United’s seven games in all competitions but he will be rewarded with a new and improved contract, which he is expected to sign before the end of the year. The Spanish international came on for the final 15 minutes of the Red Devils 4-0 comfortable victory over Everton on Sunday and Mourinho was very pleased with his performance from the bench. “There was a moment were I felt we did not kill it so we have to make it solid with Ander Herrera. “From that moment we controlled the game,” he also added. The 28-year-old joined United for £29m from Athletic Bilbao in 2014 scoring 15 goals in 125 appearances, winning the FA Cup, EFL Cup and Europa League. The Matt Busby player of the year was instrumental to United’s success last term and will be key to their title hopes this season with United competing on all fronts.